Where We Lay Our Scene Released! 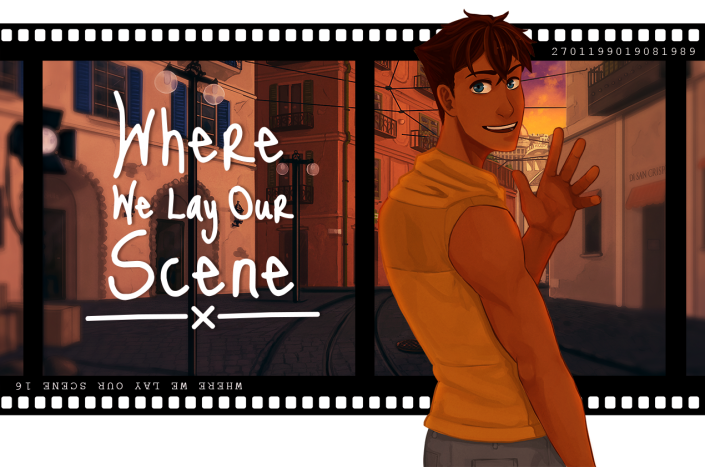 Where We Lay Our Scene (WWLOS) is a visual novel developed by Cyanide Tea for NaNoRenO 2016. Auro-Cyanide did the art and graphic design while Lorelei handled writing, programming, and sound coordination. The game features four character routes (varying genders and sexualities) and has 13 different endings. The game is commercial and is distributed via itch.io for $4.99. The game should take at least 6-8 hours to finish, on average. The main theme for this game is crossroads. Rather than having “good” and “bad” endings, each love interest has a friendship ending as well as romantic “A” and “B” endings. Neither romantic ending is meant to be better than the other. For more information about the game and to download the demo or purchase the game, please see the official website. The game costs $4.99, but if you’d like to leave us a tip, we’d really appreciate it! Comments, criticism, and cookies are all very welcome! There is also a survey you can fill out after finishing a route, which will provide us with important feedback that we’ll use for our future projects. We hope you enjoy our game!